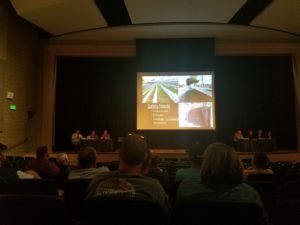 The Knoxville Community School District held an informational town hall meeting Wednesday night, gauging the public’s interest on improvements to Ken Locke Stadium. A committee including school board members and district employees gave a presentation detailing the safety, maintenance, and lack of amenities the district is looking to improve while preserving the historical aspect of the stadium. Knoxville School Board member Larry Scott tells KNIA/KRLS News improving the stadium will improve Knoxville as a whole. Scott also said the district is planning on Ken Locke Stadium being a venue for much more than just football, but something all students can take advantage of whether it be other athletic events, band, concerts, or youth programs. Over 60 community members attended the meeting and were enthusiastic about the venture, and now the district is also looking to secure funding from groups helping with initial costs to secure a startup plan.